The mummified monkey was found by a construction team that was gutting the inside of a century-old building. Adam Peterson/Old Minneapolis/FacebookThe monkey mummy uncovered in the Dayton’s building’s seventh floor ceiling. 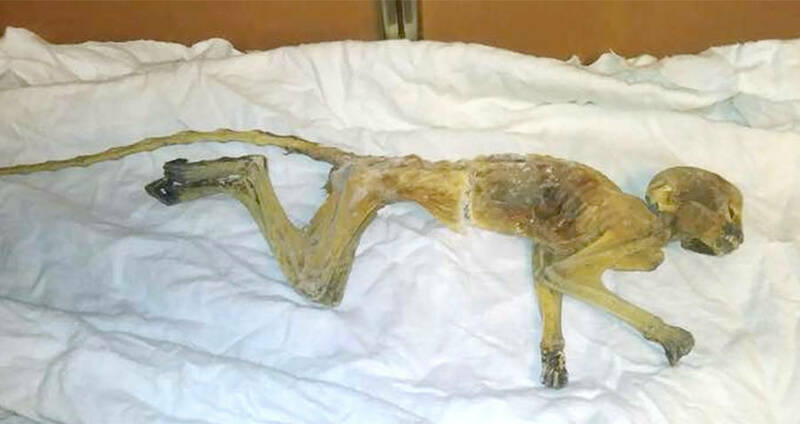 A group of construction workers remodeling a historic Minnesota department store got more than they bargained for when they opened up a section of the ceiling and found a mummified creature. The group was renovating the seventh floor of the historic Dayton’s department store building, on Nicollet Mall in downtown Minneapolis when the creature was found, nestled in the rafters. From the looks of it, it appears to be a small monkey, mummified over time. Adam Peterson, the demo worker who made the discovery, posted the photo of the monkey mummy to the “Old Minneapolis” Facebook group, hoping someone would have answers as to how the exotic little fella found his way into a Midwestern department store. Almost immediately, responses came pouring in, most of them mentioning the presence of a pet store that was once located on the building’s eighth floor. Indeed, Dayton’s did sell exotic pets at one point and was known for running ads in local newspapers for them. One commenter, Steven Laboe, said he worked in the Dayton’s building the early 2000s and was told by a building worker that a monkey had escaped from the pet store sometime in the 1960s, and had never been found. The most common theory then was that the animal had escaped into the air conditioning ducts, a theory which may have some merit. The mummified mummy was found with a cut in its abdomen, which could have been caused by an exhaust fan in the ductwork. 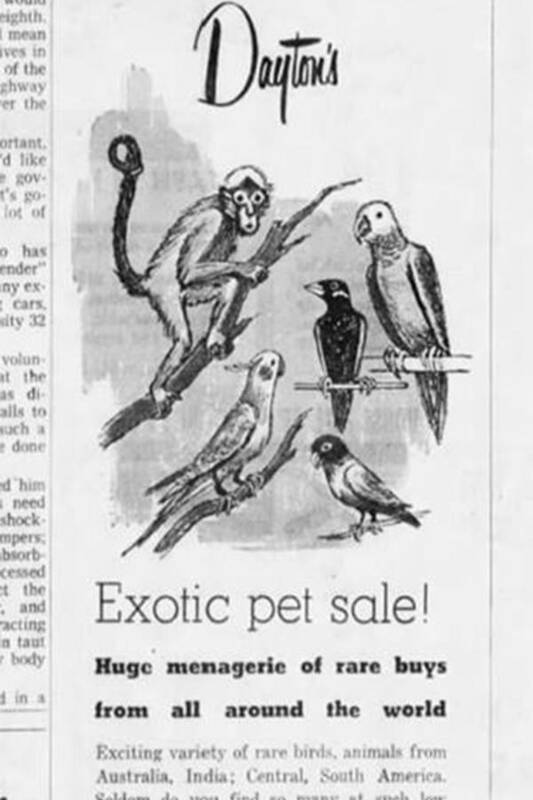 Newspapers.comA Dayton’s newspaper ad, advertising exotic pets like monkeys and birds. The monkeys were being sold for just $18.99. As stories of the pet store filled the comments section, a local town mayor chimed in with his own story. Regan Murphy, mayor of Robbinsdale, Minn., said that his father personally stole a monkey from this very Dayton’s. According to a family friend, when he was in junior high school, Murphy’s father and a friend skipped school and made their way downtown for the ultimate prank. The store was known for keeping monkeys on display in the storefront, and they were going to kidnap it. Ultimately, the pair was successful, but they soon realized that caring for a monkey was a lot of work and the pair decided to bring it back. “It pretty much just destroyed Tom’s room,” Murphy said. For now, the mystery has yet to be solved, though Murphy’s story seems like the most obvious answer. While Facebook’s amateur sleuths devote their time to finding answers, the construction team is back underway. The 116-year-old building (which started out as Dayton’s department store and was most recently home to the company’s successor, Macy’s, before being purchased by a developer) has given up more secrets than just a monkey mummy. The demo team has also uncovered an age-old stolen wallet and a set of rare nesting Easter eggs. 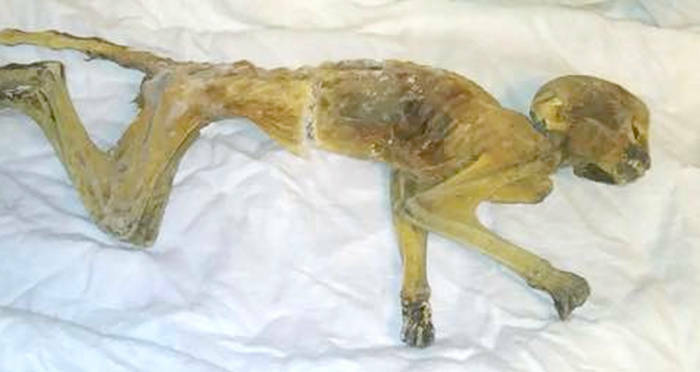 Next, meet “Stuckie,” the mummified dog found in a tree after 50 years. Then, check out the Japanese monks who mummified themselves alive.